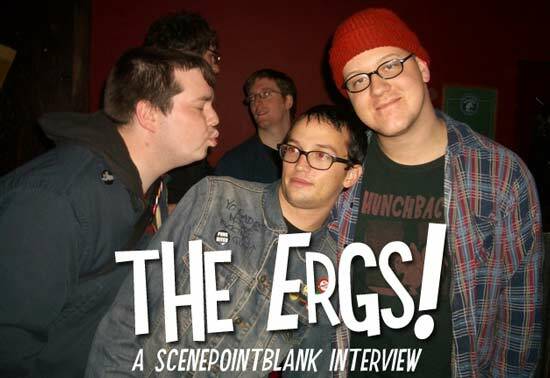 Features › Interviews › The Ergs! News of The Ergs! breakup sent many a punk-lover reaching for the Kleenex. But thankfully the band decided to commit themselves to one final release and one final tour. Scene Point Blank spoke with bassist Joe Keller about their band's farewell and what we can expect from them in the near future. Scene Point Blank: First off, a bunch of The Fest questions: How many have you played? What keeps you coming back? Joe Keller: This year will be our fourth year playing The Fest. They kept asking us to play and hey, who are we not to oblige? I don't know anyone in a punk band who wouldn't want to play in front of a packed crowd of drunken idiots. Well, anyone minus some straightedge holdovers, at least. People are still sXe, right? Scene Point Blank: What's more fun: playing The Fest or seeing other bands and hanging out? Joe Keller: Well, it all sort of overlaps. You're hanging out with your friends while you are playing or watching other bands. Seeing everyone I know from across the country is probably my favorite part, but I wouldn't downplay the viewing of bands at all. The Fest always has the best lineup - I watch more good bands at The Fest than any other punk festival. Scene Point Blank: Do you have any say in when or where you perform or do you just show up and let the organizers handle it? Joe Keller: Nah, Tony (who runs the Fest) just tells us where and when and then I make travel arrangements. Scene Point Blank: Do the bands get complementary hotel rooms or anything like that? Joe Keller: No, we don't at least. Scene Point Blank: What other bands are you excited to see? Joe Keller: I still have to sit down and go over the schedule with a highlighter like a nerd, but I know I am going to catch my usual Fest favorites like Dillinger Four, Vena Cava, Lemuria, The Measure [SA], Hot New Mexicans, Shark Pants, Paul Baribeau and The ?Waste. The three bands I plan on catching that I have never seen before are Leatherface, Future Virgins, and Gordon Gano's Army. I'm pretty excited overall. Scene Point Blank: Leatherface is great. I saw them at a convergence of two tours that had Avail, Hot Water Music, D4, and a few others in maybe 2000 and had no idea who they were at the time. They totally won me over that night. Joe Keller: My first exposure to them was their split with Hot Water Music. I'm a sucker for good lyrics and gravelly vocals. Scene Point Blank: As a Fest veteran, do you hit the point where it feels okay to miss a show because you've seen the band the last two years? Last year was my first Fest and I'm still trying to figure out how to prioritize my schedule. Joe Keller: I just try to maximize the number of good bands I can see. Of course bands I've never seen before get preference, but usually it's not too bad for me to come up with a schedule I can live with. Although, last year I had to make the choice between The Figgs and The Marked Men; that was a tough one. Scene Point Blank: I've already done the nerd with a highlighter thing. You're up against Whiskey & Co and Tiltwheel, among others. Is there any friendly rivalry that goes on when there are eight stages sharing timeslots? Joe Keller: No, it's mainly just a bummer when you're up against your friends because you know you'd like to be watching them and they'd like to be watching you. I am saddened by the fact that a probably shirtless Davey Tiltwheel will not be up front singing along during our set. Scene Point Blank: I saw you with Hunchback a few months ago (in Minneapolis). Now both bands are calling it quits. Were things planned this way or is it just a coincidence? Joe Keller: It's just a coincidence. Both bands have had good runs and both are breaking up for different reasons. 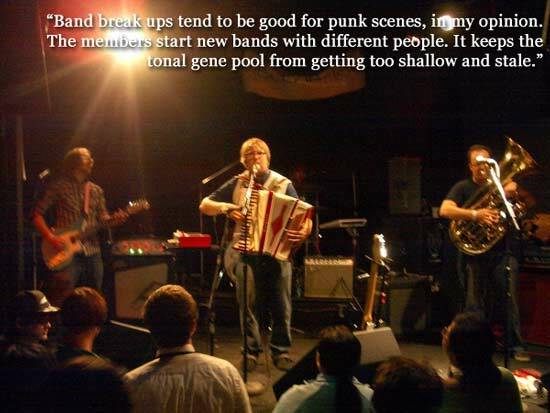 Band break ups tend to be good for punk scenes, in general, in my opinion. The members go back into the general population and start new bands with different people. It keeps the tonal gene pool from getting too shallow and stale. Scene Point Blank: Mike played in all three bands that night. Did he do that the whole tour? Joe Keller: No, he only played drums in Hunchback for the last week of the tour. The Used Kids only played a couple of shows with us - Milwaukee and Minneapolis. So Mike only had to do a triathlon for two nights. Scene Point Blank: Emotionally, how does it feel to be doing an official last tour? Is it draining to treat each city as a sendoff? Joe Keller: To me, they just feel like regular shows only the audience is a little more attentive and amped. It's probably the last chance they're going to get to yell at us to play "Pool Pass." All of the shows we've done since announcing our impending dissolution do have sort of a bucket-list feel to them, but I just keep telling myself: this is the band's last run, not mine. This is not the last time I will see all these people (especially if I keep going to The Fest.) It's not the last time I'm going to see Portland or Baltimore. Scene Point Blank: They'll probably still be yelling at your next band to play these songs too. Would you like to take an official stance on that prospect right now? Joe Keller: There will probably be no "Pool Pass" at The Fest, but stranger things have come to pass so who knows. Scene Point Blank: Have you had any embarrassing emotional moments on the tour? Joe Keller: No, I try to keep things lighthearted. I suppose it's not really dark humor because, again, it's only our band that's moribund, not any of us personally, but I try to riff on our break up on the mic during our set and in the van in private. It is only a band, after all. Scene Point Blank: How did you get involved in the Kid Dynamite tribute? How did you pick your song? Joe Keller: The folks putting it together emailed us about it. Mike picked "Fuckuturn," I believe. I think he picked it so he could do that sweet snare roll in the beginning of the song. Scene Point Blank: Is anything planned after The Ergs!? Joe Keller: I'm sure in time all three of us will be in new active bands again. Mike is already in The Measure [SA], Used Kids, and what was once only his side project, Psyched to Die. I'm holding out for a really sweet gig ? hopefully Ted Leo or the Reigning Sound is looking for a new bass player in the next couple of months. Greg Cartwright, get in touch with me. Scene Point Blank: Why the exclamation point? I think of Airplane! everytime I see the band's name. Joe Keller: Y'know, I was against the exclamation point, but after somebody gets a tattoo of it in reference to your band, what are you going to do? I don't want to be responsible for any laser removal surgery. Scene Point Blank: Where is this tattoo you speak of? It's not anywhere unmentionable? Joe Keller: A lot of people have one now. It's usually a legs-or-arms sort of tattoo. I don't know of any Ergs! neck tattoos thus far, but if Fid from The Measure ever gets the urge to go for Ergs! tat numero dos, you might see it happen. Scene Point Blank: Thanks for your time and good luck. Joe Keller: And the same to you, sir! Posted Aug. 10, 2014, 8:36 a.m.
Posted Jan. 22, 2013, 12:14 p.m.